This is our family’s fruitcake. My parents had it for their wedding cake; we had it for ours, and many cousins and other relatives have as well. Pounds of it are made every Christmas, soaked in brandy and left to age. It makes a great snack for hiking, boating & fishing on the west coast (would probably work on any coast), so extra is made to use during the rest of the year. Often I still have a piece in the pantry from the year before, found when I’m cooking that year’s batch. Emily Allen was my mother’s mother’s mother. She lived in London in a big old house on Palmers Green (still stands today) with her husband and large family. Pictures we have of the early years of the 20th century show them scrambling over seaside rocks or climbing over hills and dales (literally) with picnic baskets and sports equipment in tow. Her recipes from that time are barely legible now, faded on well used and splattered pages. 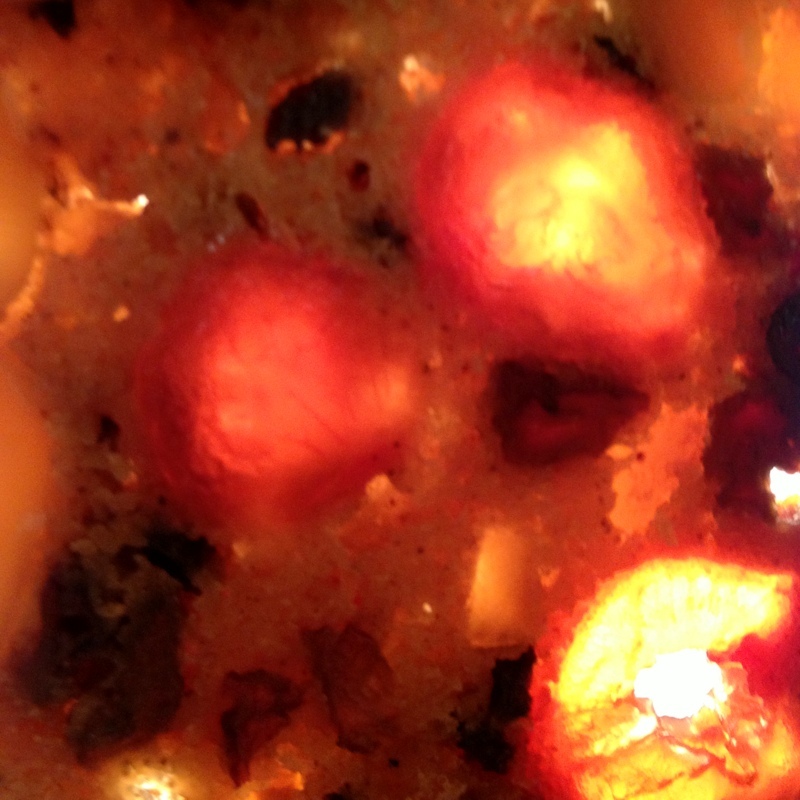 Her recipe showed two forms, a dark fruitcake and a light fruitcake. There’s only a couple of ingredients that create the difference. Honey and cider for the light cake and molasses and grape juice for the dark cake. There was a scribbled note about black currant jelly, and she may have used it instead of the molasses. I wonder if it really is her recipe, or was it her cook’s? We prefer the light cake, so that is the recipe I have written. If you want to try the other form, just replace the two ingredients. 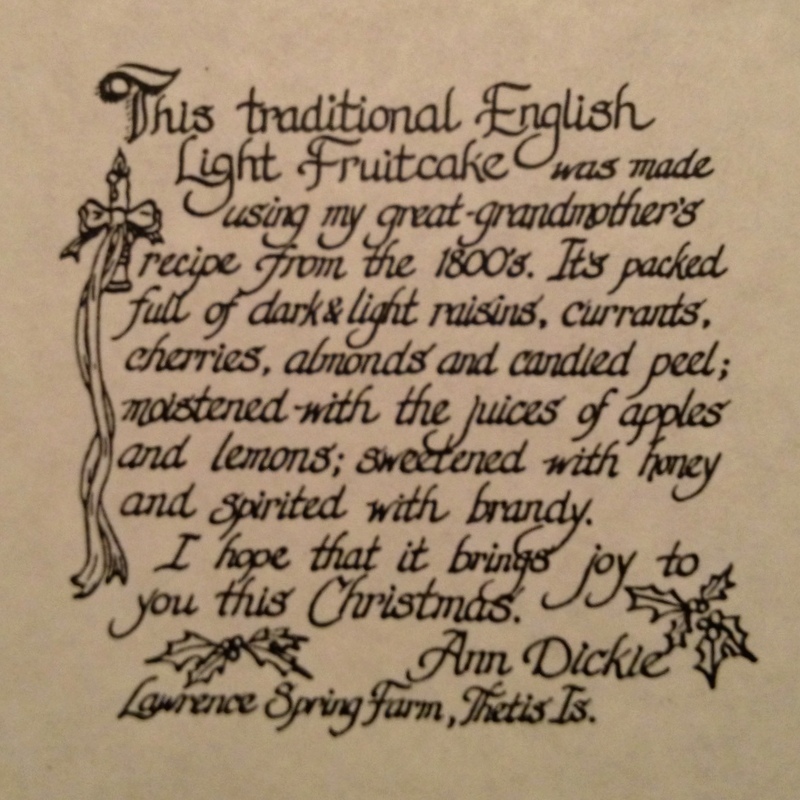 I read a description of perfect fruitcake written by a monk in the 1800’s. He suggested that there should be barely enough cake to hold the fruit together and when sliced thinly it should resemble a stained glass window. This recipe meets both of these requirements. It easily cuts to ¼“. I don’t know if glacé cherries are the same now as they were a hundred years ago, but today’s version will have to do. The rest of the ingredients are pretty ageless. I used to make hundreds of pounds of this cake, selling it to make Christmas money. A 1# wrapped cake would sell for $10 in the 80’s. I finally stopped when I realized that from late October to the last weekend in November (my latest date of production), that I’d made at least 2 batches if not 3 each day. I decided I’d rather spend time with my family than make money to spend on them! I still like to make some 1# cakes for gifts, and enough 2# cakes to keep our extended family happy. Note: mixed peel – be sure it is actually citrus peel and not preserved rutabaga. 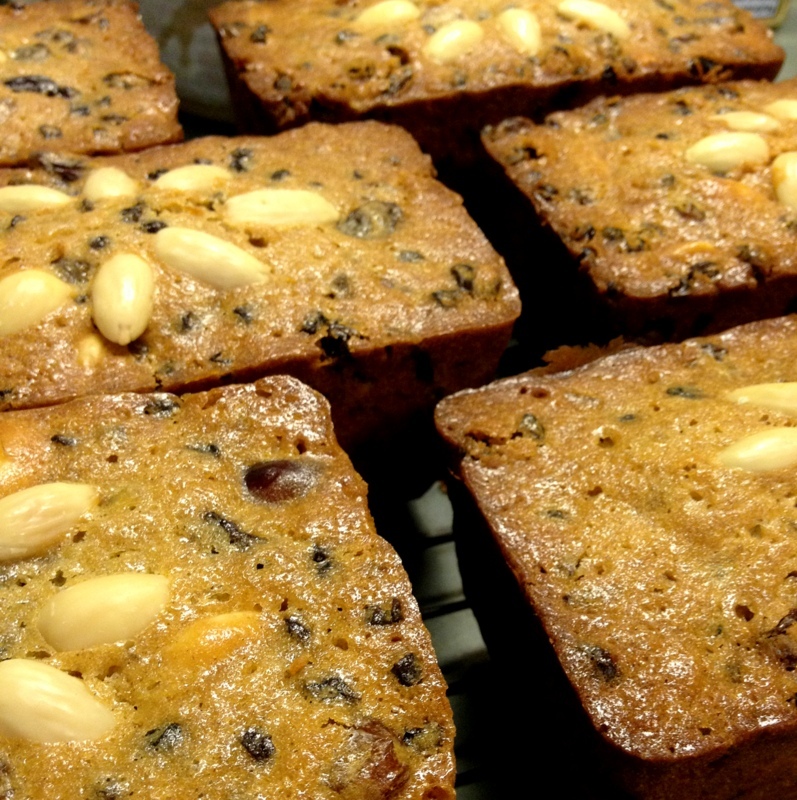 This is an inexpensive alternative that finds its way into Christmas cake fruit mixes. Also, when buying cherries, be traditional and stick with red. Green & yellow aren’t acceptable.